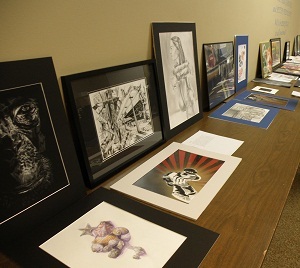 This year we had 19 incredibly talented students participate in the scholarship competition from Royal, Simi, and Santa Susana High Schools. Raahima Shoaib, Alee Ruggieri, Ricardo Olmedo, Xiao Peng, Isha Patel, Nina Vo, Alyssa Davis, Andrew Allen, Song Park, and Taylor Currie. They each received a drawing pad. 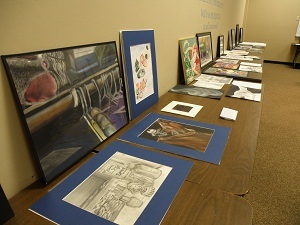 SVAA awarded over $1,200.00 in cash awards and artist materials to our talented students. 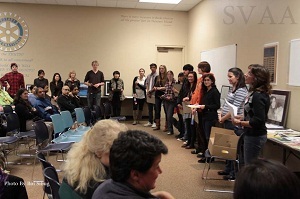 SVAA also gave two Members Choice Awards of $50 each, which were chosen by contributing members that included Anne Cannata. Gifts donated by local vendors and individual donors were also raffled off. We THANK all the generous contributors who helped make that possible. Stearn and Los Angeles Ave.